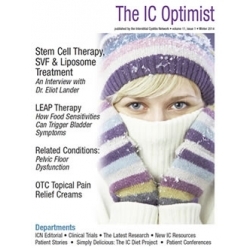 (1) Editorial: Is Interstitial Cystitis Caused by Anger? No! - Hard to believe that some patients are still being blamed for their symptoms. Recently, one was told that her IC was the result of her anger about an ex boyfriend. We ask "How would you handle it?" (2) Feature Story: The Economic Toll of Elmiron - The skyrocketing cost of Elmiron has been a growing concern with some patients reporting that they are now being forced to pay more than $1000 a month for their prescription. 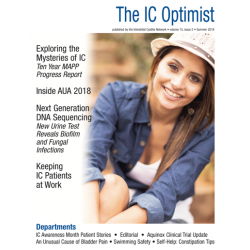 In this exclusive article, we share the results of an ICN survey which tracked pricing trends and rising out of pocket expenses and offer alternatives for patients who can no longer afford this medication. 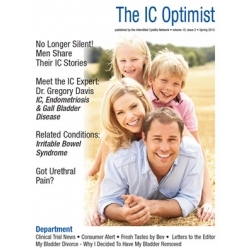 (3) Feature Story: The Stomach, Bowel & Bladder Connection - If you've suffered from stomach distress in addition to your IC and/or IBS, you aren't alone. A 2014 ICN research survey found that the great majority of IC patients struggle with chronic stomach complaints including gastritis, GERD, gastroparesis and ulcers. (4) The Latest Research - IC researchers continue to produce meaningful research studies to help us understand why and how IC occurs. The most surprising recent study found the Polyomavirus BK virus in patients with Hunner's Lesions but not in patients with glomerulations. This is the first confirmed viral connection revealed for a subset of IC and it's creating buzz in the IC world. (5) Ten Simple Things You Can Do To Feel Better Now - IC author Julie Beyer RD knocks it out of the park with an article that offers ten pratical tips that you can do TODAY to help control and reduce your symptoms, perfect for those patients who struggle with flares. (6) What You Should Know About Food & Pesticides - The 2015 Klean Fifteen and Dirty Dozen food lists were released showing, yet again, that many of our foods carry significant pesticide contamination. Avocado lovers will rejoice as it was the safest food tested. On the otherhand, potatoes, apples & peaches had significant problems. We hope that this list will help you pick safer foods! (7) Consumer Alert - Unfortunately, research has revealed that certain medications often used by IC patients may, when used for long periods, contribute to cognitive decline and dementia. We previously thought that only seniors were at risk, but new research shows that 30-39 year olds actually have the higher risk. Medication alternatives are shared. 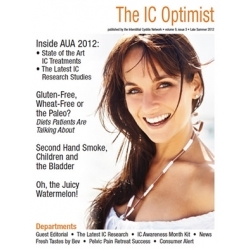 (8) The Best IC & Pelvic Pain Moments of 2014 - Here's a fun wrap up of the highlights of 2014 including the best blogs, rants, research, books and patient projects! (10) Self Help Tip: Ten Essential Tips For Cystoscopy With Hydrodistention - Though no longer the gold standard test for IC, a cystoscopy with hydrodistention is still used, particularly in the identification and treatment of Hunner's lesions. We share ten essential tips to help patients plan for and recover from this procedure. (11) Patient Story: IC Friendly Snacks - IC patient Angela Atkins shares her list of favorite IC friendly "sweet treats" and "salty eats" for patients looking to satisfy those sneaky cravings!